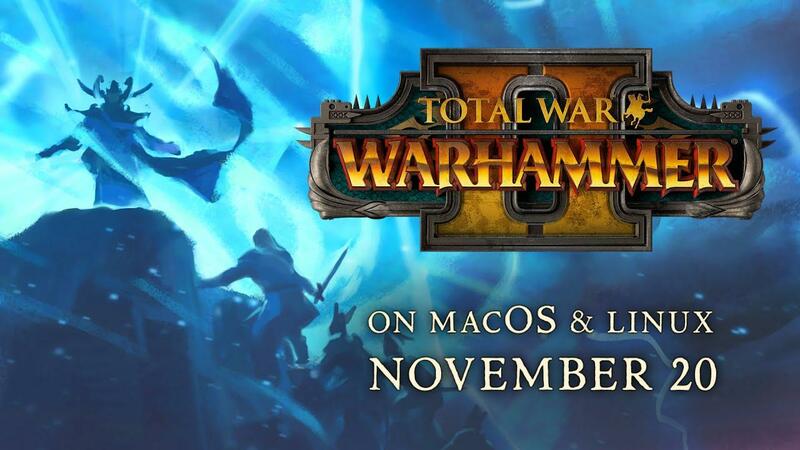 Feral Interactive have announced that Total War: WARHAMMER II for Linux is officially releasing on November 20th. Originally developed by Creative Assembly in partnership with Games Workshop and published by SEGA for Windows, this is the follow-up game to the original which was released for Linux in November of 2016. Additionally, they tested it with the NVIDIA driver 396.54 and on AMD with Mesa 18.1.5. They previously confirmed it will be using the Vulkan API. You can pre-order directly from the Feral Store, to ensure Feral gets the best cut to continue their fantastic Linux porting work. Something I wish to see continued for many years as I've enjoyed so many of their games I otherwise wouldn't have played. This will make their 5th Linux port this year (if you count the XCOM 2 DLC). Otherwise, keep an eye on Humble Store and Steam. We haven't been provided access before release, so any full review and port report will be sometime after release. As always, we will do our best to ensure you're informed of what you need to know. It's quite a popular game, with around twenty thousand people playing it right now so it's a good choice for a Linux port. It's been pretty well received by critics and users alike too. Patola YESSSS! Finally! Awesome news!!! What about the DLCs? Will they also be sold? They're up for pre-order on Feral's site as well. So, lets be happy for this new AAA and let's try to rethink before posting any negative comment for this type of news. That depends of your concept about what is an AAA game. For me, games without Spanish voice overs are not AAA, and it doesn't matter how famous the franchise is. This is an indie game for me... The same goes for The Witcher franchise. Anyway! For tastes, the colours. Apparently I got a 'valid until 11/21/2018' 50% off coupon too! Only played the first one once, though the other night was thinking I should play it some more. Comandante Ñoñardo That depends of your concept about what is an AAA game. Really? Total War indie games? It's not about taste, the AAA category it's about how much you invest to make the game. Of course, that doesn't implies that it will be an excellent game, but still on this case means that a game that has a big player base is getting a native version in our system. And that my friend is one of the pillar base in order to make Linux a gaming platform. Ha, AAA games as a definition has always been a moving target. Is it popularity? Call of Duty is considered very popular and AAA, but it's not something that I obsess with. Quality? Probably not. Large production? Yup, that's usually what it means. The Witcher definitely is. But Indie? That's usually when it is a small studio developing and maybe publishing it. That is definitely not Sega/Creative Assembly. I'd even say inXile (before Microsoft bought them) would be considered borderline not-Indie, since I think they have a decent amount of people working for them, though they technically were and independent developer, now sucked into the grasp of MS.
Kiba It will have cross-play?? Probably not. None of the Total War games have, as far as I'm aware, so I wouldn't expect it here. A pity really, but not a whole lot Feral can do about it either. I wouldn't call Total War Triple A either. Voice overs is an interesting line to draw. The biggest games have advertisments in the streets (Battlefield, Red Dead, GTA, ...). But Total War isn't indie either. It's just an ordinary... "mid-sized" game. My favorite game of all times is by far Company of Heroes 2 with close to 1000 hours and counting, but I have also spent several hundred hours playing Total War Empire, Rome, Medival II, and Warhammer. So I fully expect Warhammer II to be a fun addition to this collection with many hours of entertainment and it is a certain buy for me. It was the fact that all these games (together with games from Paradox, Klei among others) were available on Linux that finally made me ditch Windows and only use Linux almost 2 years ago. It may be one of the best decisions I ever made. So I can only say - Thank You Feral Interactive! Uhm.. Then i'll force my friends to install Linux if they want to play with me, i'm just sick of windows.